There is a major eclipse over much of North America this month. The sun will go dark during the day right in the middle of a cloudless day. An eclipse is when one object completely blocks another. If youâ€™re big on vocabulary words, the word that describes this as a syzygy, which is a straight line of three objects like the Earth, Moon, and Sun. It just so happens that the Sunâ€™s diameter is about 400 times larger than the Moon, but the Moon is 400 times closer than the Sun. This makes the Sun and Moon appear to be about the same size (about the size of a quarter held at armâ€™s length). This is also why the eclipse thing is such a big deal for our planet. 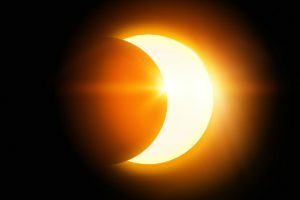 A solar eclipse happens when the Moon blocks the Sunâ€™s light. Lunar eclipses occur when the Earth is in the middle and makes the moon look strange. Lunar eclipses last hours, whereas solar eclipses last only minutes. 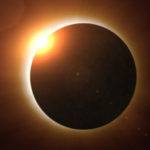 The partial solar eclipse on Monday, August 21, will be viewable on Cuesta Collegeâ€™s San Luis Obispo Campus in the Bowen Observatory (Science Forum room 2404) from 9:00 a.m. – 10:30 a.m. The public is invited to take part and safely observe the moon passing in front of the sun through the Bowen Observatoryâ€™s 14â€ telescope. Although seen as a total solar eclipse in other parts of the United States, San Luis Obispo will only experience a partial solar eclipse. The Solar Eclipse is August 21st. There’s a presentation at the Atascadero Library on August 3rd by Joseph Carro. The President of the Central Coast Astronomical Society. CLICK HERE to hear the chat we had with Joseph on the air. It’s been 99 years since the last total solar eclipse, and on August 21, everyone in North America will finally get to see another one. No matter where you’ll be, you’ll get to see at least some of this amazing event. Head to www.vox.com and enter your zip code, it will tell you exactly what time the moon will cover the most of the sun. For a moment, when the moon moves between the Earth and the sun, everything will go completely dark. The moon will block all of the light from the sunâ€”but only for people in the “path of totality”. From a 70-mile stretch between Salem, Oregon and Charleston, South Carolina, the total solar eclipse will be seen. Everywhere else in the U.S. will see a partial eclipse. There won’t be another total solar eclipse until 2024 and if you’re outside this path of the total eclipse, you can also use the tool to determine the city with the best view closest to you.